Although the Pulmonary Embolism Severity Index (PESI) accurately identifies 35% of patients with acute pulmonary embolism (PE) as being low risk, some patients deemed high risk by the PESI on admission might be treated safely in the outpatient environment. This retrospective cohort study included a total of 304 consecutive patients with acute PE, classified at the time of hospital admission into PESI class III. The PESI was recalculated 48 h after admission (PESI48) and each patient reclassified into the corresponding risk category. The primary outcome of the study was all-cause mortality between day 2 and day 30 after PE diagnosis. 26 (8.5%) patients (95% CI 5.4–11.7%) died between day 2 and day 30 after PE diagnosis. Investigators reclassified 83 (27.3%) patients (95% CI 22.3–32.3%) as low risk (classes I and II) at 48 h. 30-day mortality in these patients was 1.2% (95% CI 0–3.5%) as opposed to 11.3% (95% CI 7.1–15.5%) in those who remained high risk. The net improvement in reclassification was estimated at 54% (p<0.001). In a cohort of intermediate-risk patients with acute PE, calculation of the PESI48 allows identification of those patients at very low risk of dying during the first month of follow-up. Venous thromboembolism (VTE) is a common and potentially life-threatening disorder, with >600,000 incident cases occurring annually in the USA . Rapid treatment with either unfractionated heparin (UFH), low-molecular weight heparin (LMWH) or fondaparinux clearly reduces the rate of recurrent and potentially fatal events . Treatment with fixed-dose subcutaneous UFH, LMWH or fondaparinux does not require laboratory monitoring and facilitates outpatient therapy or early discharge from the hospital. Outpatient therapy has become the standard of care for most patients with deep vein thrombosis (DVT) [3, 4]. However, since patients presenting with acute pulmonary embolism (PE) have worse short-term outcomes and a higher risk of fatal recurrent VTE than those who present solely with acute DVT , physicians are reluctant to treat them outside of the hospital setting. Risk stratification of patients with PE may allow for accurate selection of low-risk patients who are appropriate candidates for outpatient treatment. Two clinical models for determining prognosis in patients with PE, the Pulmonary Embolism Severity Index (PESI) and the simplified PESI (sPESI), have been extensively externally validated [5–8]. Both models consist of objective, easily identifiable factors that can be ascertained within minutes of a patient’s presentation, and they do not require laboratory or imaging assessments (table 1 and 2). 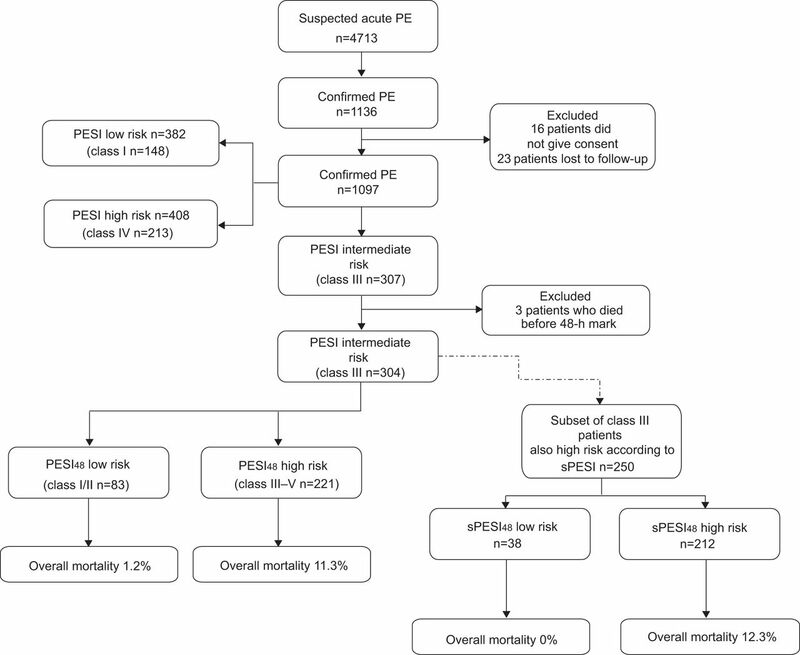 Although the PESI and sPESI accurately identify one-third of low-risk patients with acute symptomatic PE, it will overestimate risk in many others, as the overall mortality in higher-risk groups is only 10% . These data suggest that certain subgroups of patients initially deemed high-risk by the PESI or sPESI might also be treated safely in an outpatient environment. Moreover, for a prognostic score (i.e. PESI and sPESI) to be valid, the measure should be responsive to treatments that improve survival. This study aimed to assess the association between repeat PESI measured 48 h after initiation of anticoagulant therapy (PESI48) and the risk of all-cause mortality in patients with an objectively confirmed episode of acute symptomatic PE, who were classified at the time of hospital admission into class III on the basis of the PESI. In addition, we sought to examine the utility of the sPESI scores in these patients at admission and after 48 h (sPESI48) as another potential way to further stratify this intermediate-risk group of patients. For a prospective registry, we attempted to enrol all patients with a diagnosis of acute PE between January 1, 2003 and May 31, 2009. All patients provided informed consent for their participation in the prospective registry in accordance with the requirements of the ethics committee of the hospital, and this study was approved by the human subjects committee. Patients were recruited from the Emergency Department of Ramón y Cajal Hospital (Madrid, Spain). Eligibility criteria for this study required that patients have acute symptomatic PE confirmed by objective testing. A diagnosis of PE was confirmed by either a high-probability ventilation–perfusion scan result (according to the criteria of the Prospective Investigation of Pulmonary Embolism Diagnosis ), a lower-limb venous compression ultrasonography positive for a proximal DVT in patients with inconclusive ventilation–perfusion scans  or previously described criteria to detect acute PE on contrast-enhanced PE-protocol helical chest computed tomography (CT) . Using prospectively collected baseline data at the time of PE diagnosis, investigators retrospectively calculated the PESI. The study considered for inclusion only patients who were assigned to class III (86–105 points) according to the PESI. The primary outcome used to validate the prediction rules was all-cause mortality between day 2 and day 30 after diagnosis of acute symptomatic PE. The secondary outcome was objectively confirmed nonfatal symptomatic recurrent VTE or nonfatal major bleeding. The primary analysis compared the mortality rates in the class III patients who could be reclassified as low risk at 48 h (PESI48 classes I and II) compared with those who remained high risk (PESI48 classes III–V). As a secondary analysis, we compared outcomes in those class III patients who were also classified as high risk according to sPESI who were, or were not, reclassified as low risk by the sPESI48 (fig. 1). Flow diagram of patient enrolment and outcomes. PE: pulmonary embolism; PESI: Pulmonary Embolism Severity Index; PESI48: Pulmonary Embolism Severity Index 48 h after admission; sPESI: simplified Pulmonary Embolism Severity Index. We assessed mortality using patient or proxy interviews, and/or hospital chart review. Patients with symptoms or signs of recurrent VTE were evaluated using objective tests. Recurrent DVT was diagnosed by the appearance of a new noncompressible vein segment, a ≥4 mm increase in the diameter of a thrombus on venous ultrasound, or a new intraluminal filling defect or an extension of a previous filling defect on a venogram . Recurrent PE was confirmed either by a new perfusion scan defect involving ≥75% of a lung segment, or by the presence of a new intraluminal filling defect or an extension of a previous filling defect on helical chest CT . Trained attending radiologists blinded to patient clinical information assessed the imaging studies. Bleeding complications were classified as “major” if they were overt and were either associated with a decrease in the haemoglobin level of ≥2.0 g·dL−1, required a transfusion of ≥2 units of blood or were retroperitoneal or intracranial. Patients were initially hospitalised and treated with therapeutic doses of parenteral anticoagulants (intravenous UFH or weight-based doses of subcutaneous LMWH (enoxaparin)) while their treatment was converted to oral vitamin K antagonist therapy. Thrombolytic treatment was instituted in patients with confirmed PE and haemodynamic impairment as deemed appropriate by the attending physician. After the initial “overlap” treatment period, patients were continued on dose-adjusted oral vitamin K antagonist therapy (acenocoumarol; target international normalised ratio (INR) of 2.5 (therapeutic range 2.0–3.0)). The INR was usually monitored daily until the therapeutic range had been achieved, then twice or three times weekly for the first weeks, and then once a week to once a month, depending on the stability of the results. Patients that developed contraindications to anticoagulant therapy had an inferior vena cava filter placed and the anticoagulant discontinued. Baseline characteristics are presented as mean±sd for continuous data and counts and proportions for categorical data. Two investigators (C. Zamarro and V. Gómez) assessed each patient’s characteristics 48 h after PE diagnosis, and determined each patient’s risk classification according to the criteria for the PESI and the sPESI. For the PESI, risk classes I and II were assigned to the low-risk category, while risk classes III–V were assigned to the high-risk category . For the sPESI, patients were classified as low (0 points) or higher risk (≥1 point) . In cases of disagreement between the two investigators, a third investigator (D. Jiménez) established the final score by consensus with the other investigators. For each prognostic model’s risk classes, the proportion of patients with 30-day adverse outcomes (all cause mortality, or nonfatal recurrent VTE and nonfatal major bleeding) was determined. Proportions of patients in cohort risk classes and proportions of patients with adverse events among groups were compared with the Chi-squared test with Yates’ correction or Fisher’s exact test and McNemar’s test. To assess the test and performance characteristics of the low-risk versus high-risk categories of the prediction rules, we estimated sensitivity, specificity, and positive and negative predictive values. We examined the proportion of patients who would be reclassified as higher or lower risk when the PESI was calculated 48 h after admission, and calculated the values of the net reclassification improvement (NRI) and the integrated discrimination improvement (IDI) . We used Statistical Package for Social Sciences (SPSS, version 15.0; SPSS Inc., Chicago, IL, USA) to calculate estimated odds ratios and 95% confidence intervals from the binomial distribution. Of the 4,713 patients evaluated for possible acute symptomatic PE during the study period, 1,136 (24%) had objectively confirmed PE. Since 16 (1.4%) patients refused to give informed consent, and 23 (2.0%) were lost to follow-up, the evaluable population consisted of 97% (1,097 patients) of eligible patients with acute PE. Of these, the PESI classified 13.5% of patients (148 out of 1,097) as class I, 21.3% (234 out of 1,097) as class II, 19.4% (213 out of 1,097) as class IV and 17.8% (195 out of 1,097) as class V. The PESI classified 307 patients (28.0%) as class III, of whom three died within the first 48 h after diagnosis of PE, leading to a final study sample of 304 patients (fig. 1). table 3 shows the patients’ clinical symptoms, predisposing conditions and relevant findings at presentation. Of the 304 patients in the study sample, 26 (8.5%; 95% CI 5.4–11.7%) died between day 2 and day 30 after PE diagnosis. All patients had the primary and secondary outcomes assessed. Overall, 15 (57.7%) patients died from definite or possible PE, one (3.8%) from intracranial bleeding and 10 (38.5%) from other causes (cancer n=5, infection n=3, renal failure n=1, seizures n=1). Seven patients reached the secondary end-point: three patients had an episode of objectively confirmed nonfatal symptomatic recurrent VTE and four patients had an episode of nonfatal major bleeding. Treatment information was available for all patients enrolled in the study. Of the 304 patients, 272 (89%) patients received initial therapy with LMWH, 30 (9.9%) received unfractionated heparin, five (1.6%) received an inferior vena cava filter and 10 (3.3%) received thrombolytic therapy. Investigators reclassified 83 (27.3%) out of 304 patients (95% CI 22.3–32.3%) as low risk (classes I and II) when the PESI was calculated 48 h after diagnosis of PE (PESI48). Reclassification was due to changes in heart rate (n=23), systolic blood pressure (n=3), respiratory rate (n=8), temperature (n=23) and arterial oxyhaemoglobin saturation (n=29). The 27.3% (83 out of 304) of patients classified as low risk by the PESI48 had a 30-day mortality of 1.2% (95% CI 0–3.5%), compared to the 11.3% (95% CI 7.1–15.5%) in the high-risk group. Of note, 16 patients were reclassified into classes IV (n=7) or V (n=9) when the PESI was calculated 48 h after diagnosis of PE, and mortality in this group of patients was 50% (95% CI 25.5–74.5%). 205 patients remained in class III after 48 h. 17 of these patients died. Mortality was 8.3% (95% CI 4.5–12.1%). Of the 304 patients who were PESI class III on admission, 250 of them were also high risk according to the sPESI. At 48 h, 38 (15.2%) out of 250 (95% CI 10.7–19.6%) patients were reclassified as low-risk (sPESI48). These patients had a 30-day mortality of 0%, compared to 12.3% (95% CI 7.8–16.7%) in the group that remained high-risk. The PESI48 low-risk patients and the sPESI48 low-risk patients had a similar mortality (1.2% (one out of 83) versus 0% (0 out of 84)) during follow-up. The 30-day rate of nonfatal recurrent VTE or major bleeding was similar for both prediction rules’ low-risk strata (2.4% (95% CI 0–5.7%) versus 4.8% (95% CI 0.2–9.3%)). The sensitivity, specificity and predictive values for the PESI48 for predicting 30-day mortality and all adverse outcomes are listed in table 4. Characteristics of the sPESI48 as an additional risk stratification tool are listed in table 5. The NRI was estimated at 54% (p<0.001) using the PESI48, resulting from a net 27% increase in nonsurvivors correctly identified as being at high risk and a net 26% increase in survivors correctly identified as being at lower risk. The IDI was estimated to be 0.03 (p<0.001). Heart rate ≥110 beats·min−1 resulted in a net 28% increase in survivors correctly identified as being at low risk. Systolic blood pressure <100 mmHg resulted in a 3.6% increase; respiratory rate ≥30 beats·min−1 resulted in a 9.7% increase; temperature <36°C resulted in a 28% increase; and arterial oxyhaemoglobin saturation <90% resulted in a 34% increase in survivors correctly identified as being at low risk. None of the patients who were reclassified with the sPESI48 died during follow-up. Calculation of the sPESI48 resulted in a net 11% increase in survivors correctly identified as being at low risk. The IDI was estimated to be 0.02 (p<0.001). The current analysis describes longitudinal changes of the PESI and the sPESI in a cohort of patients with intermediate-risk acute PE. The results suggest that the PESI and the sPESI change after first 48 h of therapeutic intervention and that this change relates to subsequent mortality. Patients with PE present with a wide spectrum of signs and symptoms, which, in the context of other comorbidities, determines the intensity of treatment and the treatment setting. The PESI score has been shown to identify accurately patients who are at low risk of short-term adverse events, such as death, recurrent VTE, fatal PE and major bleeding [7, 8, 15]. Moreover, an international randomised trial showed that low-risk patients (PESI classes I and II) with acute symptomatic PE can be safely treated as outpatients . Although the PESI accurately identifies approximately one-third of patients with acute symptomatic PE as low-risk , it may overestimate the risk in many others  who might still benefit from early discharge. Our data provide an important insight into how short-term changes in a composite prognostic index can be used to predict mortality in a large group of treated patients with intermediate-risk PE. We noted that a decrease in PESI and sPESI after 48 h of treatment was associated with decreased subsequent mortality during follow-up. Perhaps more importantly, patients reclassified into the high-risk category had very high short-term mortality. Changes in the PESI48 were mostly attributable to improved heart rate, temperature and arterial oxyhaemoglobin saturation. Although different studies have suggested that transthoracic echocardiography and cardiac biomarkers should be combined to optimise risk stratification and to further classify intermediate-risk patients with acute symptomatic PE [19, 20], the clinical benefit of early thrombolytic treatment has not been demonstrated for this group of patients . Thus, an approach might consist of the performance of serial echocardiographic testing and biomarker measurement. However, echocardiography is not routinely performed in patients with PE, and it is an operator-dependent and time-consuming modality. Our results suggest that calculation of the PESI48 is an accurate and simple method for characterising early response to treatment; it allowed identification of an additional 8% of patients with acute PE who had very low risk of dying during the first month of follow-up. Conversely, mortality of those patients who were reclassified into classes IV and V 48 h after diagnosis of PE was as high as 50%. These patients should be observed in a monitored setting and future studies should assess whether prognostic properties of echocardiography and cardiac biomarkers are improved in this subgroup of patients with high PESI scores despite standard anticoagulant treatment. Perhaps this is an additional group of patients that might benefit from thrombolysis. Some limitations of our study should be noted. First, since the study did not mandate treatment, we could not estimate the potential impact of treatment on patient outcomes. Secondly, although investigators collected clinical data prospectively in the cohort, we retrospectively calculated the clinical scores. Importantly, the sPESI was only calculated after the PESI, so a direct comparison of the two scores may not be viable. Finally, our study did not directly assess the impact of the clinical models on the management of PE. Thus, future studies will need to address the usefulness of the recalculation of clinical scores for identifying intermediate-risk patients who can be discharged early. In conclusion, this study suggests that the PESI and the sPESI change after the first 48 h of therapeutic intervention and that this change relates to subsequent mortality. These data provide support the use of the PESI and the sPESI to identify patients with acute PE for an abbreviated hospital stay. Members of the Instituto Ramón y Cajal de Investigación Sanitaria Pulmonary Embolism Study Group (Ramón y Cajal Hospital, Madrid, Spain): D. Barrios, S. Briongos, H. Castillo, J. Corres, L. García, V. Gómez, C. Gotera, D. Jiménez, C. Jurkok, D. Kopecna, P. Lazo, A. Lietor, E. Marín, C. Moreno, J.C. Murciano, A. Muriel, R. Nieto, M. Recio, J.M. Del Rey, A. Sam, D. Sánchez, A. Sueiro, A. Vicente and R. Vidal. This work has been supported in part by grants from FIS (08/0200), SEPAR 2008, and NEUMOMADRID 2010.
. The epidemiology of venous thromboembolism in the community: implications for prevention and management. J Thromb Thrombol 2006; 21: 23–29.
. Acute pulmonary embolism. New Engl J Med 2008; 358: 1037–1052.
. Home versus in-patient treatment for deep vein thrombosis. Cochrane Database Syst Rev 2007; 3: CD003076.
. Out of hospital treatment with subcutaneous low molecular weight heparin in patients with acute deep-vein thrombosis: a prospective study in daily practice. Haematologica 2006; 91: 1052–1058.
. Derivation and validation of a prognostic model for pulmonary embolism. Am J Respir Crit Care Med 2005; 172: 1041–1046.
. Simplification of the Pulmonary Embolism Severity Index for prognosticating patients with acute symptomatic pulmonary embolism. Arch Intern Med 2010; 170: 1383–1389.
. Prognostic models for selecting patients with acute pulmonary embolism for initial outpatient therapy. Chest 2007; 132: 24–30.
. Validation of a model to predict adverse outcomes in patients with pulmonary embolism. Eur Heart J 2006; 27: 476–481.
. Short-term clinical outcome after acute symptomatic pulmonary embolism. Thromb Haemost 2008; 100: 937–942. PIOPED Investigators. Value of the ventilation/perfusion scan in acute pulmonary embolism. Results of the prospective investigation of the pulmonary embolism diagnosis (PIOPED). JAMA 1990; 263: 2753–2759.
. Diagnostic utility of ultrasonography of leg veins in patients suspected of having pulmonary embolism. Ann Intern Med 1997; 126: 775–781.
. Central pulmonary thromboembolism: diagnosis with spiral volumetric CT with the single-breath-hold-technique – comparison with pulmonary angiography. Radiology 1992; 185: 381–387.
. A simple approach for detection of recurrent proximal vein thrombosis. Circulation 1993; 88: 1730–1735.
. Evaluating the added predictive ability from a new marker: from area under the ROC curve to reclassification and beyond. Stat Med 2008; 27: 157–172.
. Validation of a clinical prognostic model to identify low-risk patients with pulmonary embolism. J Intern Med 2007; 261: 597–604.
. Outpatient versus inpatient treatment for patients with acute pulmonary embolism: an international, open-label, randomised, non-inferiority trial. Lancet 2011; 378: 41–48.
. Prognostic models for selecting patients with acute pulmonary embolism for initial outpatient therapy. Curr Opin Pulm Med 2008; 14: 414–421.
. Prognostic significance of deep vein thrombosis in patients presenting with acute symptomatic pulmonary embolism. Am J Respir Crit Care Med 2010; 181: 983–991.
. Prognostic significance of troponin elevation and right ventricular enlargement in acute pulmonary embolism. Am J Cardiol 2005; 96: 303–305.
. Combinations of prognostic tools for identification of high-risk normotensive patients with acute symptomatic pulmonary embolism. Thorax 2011; 66: 75–81.
. Heparin plus alteplase compared with heparin alone in patients with submassive pulmonary embolism. N Engl J Med 2002; 347: 1143–1150.